NTNU colleagues are so looking forward to launching SmallSats: detailed, long- standing ocean examinations. That focus will revolutionize ocean research. In the networks of this heavyweight science network, the limitations of AUVs are acutely known, and researchers from Hawaii to Hong Kong will attest, that it is harder to communicate with AUVs than it is with space probes and their “infra- structure of Deep Space Network for spacecraft.” While “power is an important shortcoming”, too, it’s the communications problem that keeps this triad of re- searchers awake at nights. Ocean Institute expedition aboard their Falkor research vessel that explored ocean salinity fronts using multiple areal and underwater robots. He’s also been known to lecture NATO navies on combined AUV operations. AUVs (and aerial drones) in contact with each other via a ship-based ocean con- troller. SmallSats could provide these expeditions with the researchers own’ dedi- cated bandwidth (understood to only be NTNU, for now). U. of Porto’s LSTS. Several AUVs communicating via their own satellite can, with their onboard snif? ng payloads, relay in real-time an accurate picture of the dramatic changes developing across a vast ocean area: or they can con? rm by sens- ing, sampling or photographing what the SmallSats sense or see. The Schmidt In- stitute chronicled Prof. De Sousa teams deploying “several autonomous vehicles to ? nd, track, and sample various physical, chemical, and biological features of the ocean, on time-space scales not previously possible by ship or aircraft studies alone”. Given their own spectral cameras, the SmallSats would then add another layer of real-time data. 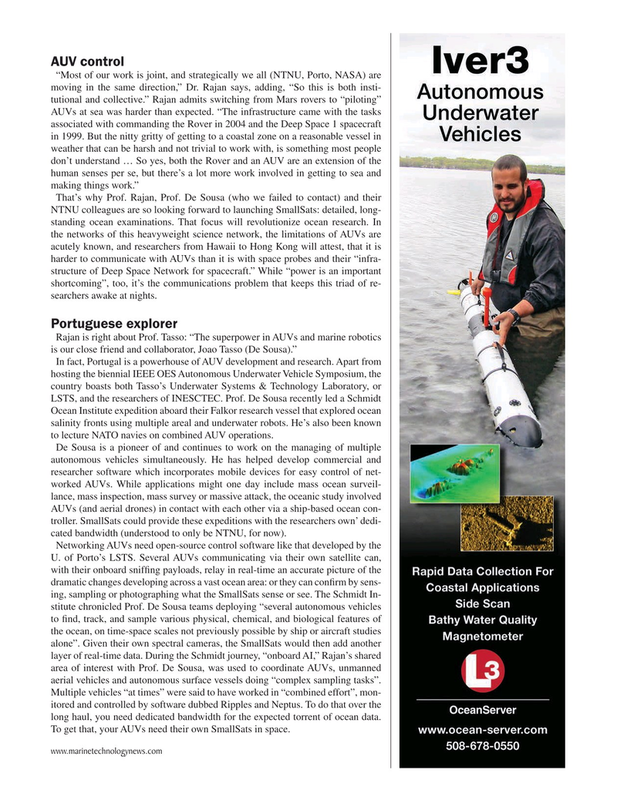 During the Schmidt journey, “onboard AI,” Rajan’s shared area of interest with Prof. De Sousa, was used to coordinate AUVs, unmanned aerial vehicles and autonomous surface vessels doing “complex sampling tasks”. Multiple vehicles “at times” were said to have worked in “combined effort”, mon- itored and controlled by software dubbed Ripples and Neptus. To do that over the long haul, you need dedicated bandwidth for the expected torrent of ocean data.